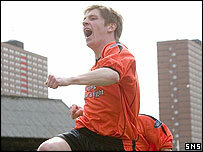 Dundee United's highly-rated wing-back Mark Wilson has signed a two-year extension at Tannadice. The 20-year-old is now under contract until 2008 after lengthy negotiations with the club. "I don't think there was ever any doubt on the part of both sides that I would be staying on and I'm delighted at the outcome," Wilson told the club website. "I enjoy playing for United, am settled in the area and have high expectations for the way the club is moving." United manager Gordon Chisholm believes the re-signing of Wilson represents further proof that the club is moving in the right direction after bringing striker Lee Miller and goalkeeper Derek Stillie to Tannadice this summer. He said: "Mark has been with the club for a number of years and is a credit to himself, and the club, in every respect. "He has exactly the right attitude and has a big future in the game. "I think he's been impressed by the quality of the signings we've made and the direction in which the club is heading. Playing in Europe for the first time was also a factor. "It's important we retain good young players, who have come up through the system, like Mark. "They are the future of the club and I believe this long-term signing is a very positive indication indeed of the future of Dundee United."